Paul Colligan is an old friend of mine, so when he asked me to join him for an interview at the Digital Cafe I was more than happy to join him. This is an interview I had with the Dallas Observer. I thought Karen Gavis did a great job on the article. She emailed me when the story first came out, and told me her editor wrote the title. I was a little confused on the title. I even had to look up the word Luddite since I was not familiar with the term. I do not see where the term applies, but as P.T. Barnum said, “Say what you want about me, just spell my name correct.” In todays terms that should be “Say what you want about me, just spell my domain correct.” Since they spelt my name, and domain correctly I am happy with the article. When Gary Leland walked into a store in 1983 to buy his first computer, a salesman asked if he knew DOS. “I’ve never met her,” Leland said, to which the salesman replied that DOS was a computer language and then showed him a new point-and-click model. “That sounds like what I need,” Leland said. Today, the former door-to-door salesman is a self-taught social media marketing guru who creates free information hubs for North Texas techies. Last year, he was inducted into the Academy of Podcaster’s Hall of Fame. “I was probably one of the first 100 podcasters on the planet,” he says. Leland co-founded Podcast Dallas, along with Mitch Todd, and has found the medium to be a great way to promote his other businesses, like his softball equipment company, which he supports with popular podcasts and e-books about fast pitch softball. Leland moved from South Carolina to Arlington nearly 40 years ago. He says he had a car with some gas in it at the time and maybe $10 in his pocket. He landed a job selling storm doors and windows before marrying his wife, Kathy, and opening up a wallpaper store. While raising their two daughters, Leland volunteered to coach the girls’ softball team, DaBomb. When he had a tough time finding softball equipment, he decided to open his own store, softballjunk.com. The brick-and-mortar store is located just behind the wallpaper store. Inside, girls and boys can be seen sizing up bats near rows of softballs and batter’s gloves, but Leland says most of the store’s sales are online. “Half of my business is from softball, which I never expected,” he says, noting that his “aha moment” came when he saw someone wearing a SoftballJunk.com ball cap shortly after he opened for business. That’s when he got into podcasting. When Leland found he was having to travel to Dallas to meet other people who shared his interests, he decided to start the Arlington Social Media Marketing Meetup group. Leland, 62, brings in people like famed Facebook marketer Dennis Yu, Topo Chico brand master Giovanni Gallucci and Amazon super seller Chris Green to share their tricks of the trade. Several businesses are even offering the group free meeting space, pizza and drinks. Arlington Mayor Jeff Williams was so impressed by Leland that during a recent City Council meeting he proclaimed March 1, 2017, as Gary Leland Day. “Thank you for making Arlington your home and for making a difference in so many ways,” Williams said. Leland makes a difference by sharing his expertise with others at no cost. Because he has been successful, he says, he wants to help other startups do the same. To learn more about Leland, visit GaryLeland.com or SocialMediaArlington.com. The next free meetup is set for 6:30 p.m. Thursday, March 30, at 1527 S. Cooper St. I was recently interviewed by Rafael Sears of The Arlington Citizen Journal. The Arlington Citizen Journal is local paper that is affiliated with the much larger Ft. Worth Star-Telegram. Rafael was at the City Council meeting when the Mayor of Arlington proclaimed Gary Leland Day and afterwards asked if he could interview me. ARLINGTON – When Gary Leland learned that Arlington Mayor Jeff Williams would proclaim March 1, 2017, as Gary Leland Day, he thought it was a joke. Leland, 62, a resident of Arlington for about 40 years, was honored at an Arlington City Council meeting recently. “Podcasting has opened so many doors for me,” Leland said. Leland recorded his first podcast, The Sports Podcast, in 2004. In 2006, Time magazine listed his website Podcast Pickle as one of the 50 coolest websites. Ten years later — last July — he was inducted into the Academy of Podcasters Hall of Fame in Anaheim, Calif.
Podcasts didn’t really take off until 2005, which is the year “podcast” was declared the word of year by the New Oxford American Dictionary, when Steve Jobs announced podcasts would be available on iTunes, according to the Tow Center for Digital Journalism at Columbia University. Leland said this is the main reason podcasts grew in popularity. Although many of the podcasts Leland has created or is involved with are about softball, he recently started a Fixer Upper podcast in which he and his wife talk about the HGTV show, and The Gary Leland Show, where he talks about his experiences as an entrepreneur, he said. What’s the one thing he dreams of the most? To throw at the first pitch at a Texas Rangers game — he even joked at the council meeting that Williams could help with that. A few months ago a young lady from the University of Texas at Arlington came in my store, and asked if she could interview me for a case study she had to do in one of her classes. I really do not think she had any idea of who I was. She simply came in because her boy friend was a softball player and suggested me as an interesting interview subject. I just received her Case Study and while she did get a few facts wrong, all in all it was pretty good. —————————————————-Gary Leland, a South Carolina native with just a high school education would have never foreseen the promising happy life he has now. Leland came from nothing and everyone that he knew from his neighbors to all of his family members were all manual labors, his parents even sent him to a two year vocational school so that he could learn the craftsmanship of being an electrician. Leland did not want that to be his story in life, so he moved to Texas in 1979 in his early twenties to get away from his environment and start fresh. He knew he couldn’t be great living in his hometown. Leland started out as a salesman in home sales with just $24 he built himself a small empire by selling mini blinds door to door, which now has turned into numerous small successful businesses. Leland, an owner of SoftballJunk.com which came into fruition in 2000, then he turned the website into an actual store in 2001. The store was the first fast pitch softball store to be established in the country. Leland’s store is a small but lucrative shop that originally sold just softball gear, but over the years developed into also carrying baseball gear is celebrating its 14’Th year in business. Leland, a father to two girls, Amanda and Lauren one could say he owes a certain amount of gratitude to his daughters. Gary’s daughters both played softball and he was their coach. Gary first created softballjunk.com in 2000 to help pay for the cost of uniforms and equipment, with four teams under his belt, one can imagine how expensive playing softball could be. Gary also owns Leland’s Interiors which was founded in 1981 by Gary and his wife Kathy. The Lelands first began selling mini blinds, and now sell custom blinds, wallpaper and other decorative textiles to suit all customer needs rather it be business or personal. Leland’s online world began in 1996, he has 25 websites and is the owner of 450 Facebook groups with 100,000 followers, he has written a number of books and owns and runs two magazines, he is the former National Director of Social Media for 3.7 million member strong United States Specialty Sports Association. Leland has his own show the Gary Leland Show, along with Fast Pitch T.V. Network. He owns and runs Podertainment.com and is the publisher of Podertainment Magazine, a magazine at a rate of $12.99 a month, which welcomes ideas for original editorial content from guest writers. Leland is believed to be one of the first 50 pioneers of podcasting. At a point in time in the interview Mr. Leland described his business as a wagon wheel, all spokes… his websites, his books, and his magazines all lead back to his stores Sports Junk and Leland’s Interiors. After high school, Gary, a 27 year old young man worked for a marketing company which travelled 3-6 months per city opening cable t.v. markets that taught people how to be door to door salesmen. The business was supposed to move on to Louisville, Kentucky but he met Kathy, his wife to be and stayed in Texas and started selling storm windows. He wanted to get out of in home sales so he got involved with a vending food company. The company ran restaurants for larger corporate companies, General Motors was one of the accounts Gary personally ran. Gary stayed with the company for a year or two and then went back to in home sales selling mini blinds door to door, at that time new houses and sub divisions were built and no one had mini blinds to protect their privacy. New home owners would just put up sheets, the 1 inch mini blinds had come into fashion and the blinds couldn’t be purchased at home depot or other retail stores. Gary would sell the mini blinds and receive a thousand dollars per house, he and his friends were rolling in the dough. He had a quota to make which was a million dollars a year, Gary had made his quota by January 8th, he gave his boss two weeks’ notice and decided to go into business himself selling mini blinds full-time. One could say that Gary Leland fell into his own businesses he loved in home sales, and still does. Leland did not have business plans or business models, he started out going door to door selling high pressure storm windows. He did however have some help when it came to establishing his first website in 1996, against the advice of his friends, who said nothing will come of that Gary pursued it any way. Gary can see the big picture, “you gotta know what the people want”. While being an in home salesman Gary was bringing in thousands of dollars, he was an optimistic, charismatic person who could sell anything, who just happened to be a relatable average guy and people loved that. The success that in home sales brought him was what started his first business Leland’s Interiors. At that time there were many small interior businesses in Arlington on Cooper Street and Gary’s was one of them. His friends saw how successful Gary was becoming and they wanted to work for him, and they did. After years of working under Gary his friends realized that he was receiving 100% of the business revenue and they wanted that income for themselves; so Gary helped his friends establish their own interior businesses. To this day Gary has gone on to accomplish a plethora of successful small businesses and his friends still just have one interior business, and his friends are all college educated; in fact they all graduated from Texas’ top schools. A college education isn’t everything when it comes to being successful, Gary’s many successes are proof of that. Gary agrees and strongly feels that a college education is important and that everyone should go to college. He tells the technology gifted people he frequently comes in contact with that they too should attend college, regardless of how skilled they are at being techs. Leland’s Interior’s is now one of the largest and most successful interior stores in Texas, Gary and his wife Kathy started in a smaller shop but over time their business grew and they moved into a larger brick and mortar store. The other textile companies that were located on Cooper Street have since then gone out of business, when they did Gary bought their textile books and materials for pennies on the dollar. One could say that Gary was and is successful from the other business owners’ failures. The same with his softball and baseball junk store, Gary heard that a business owner was going out of business in Fort Worth, Texas and Gary offered to buy the man’s gear, but the man refused to admit that his business was foreclosing. In the end Gary was able to save money and buy the gear for pennies on the dollar, another success from someone’s failure. Gary starts his days at six am, gets up checks his emails and social media sites as he watches T.V., specifically the news. He then heads to the Leland’s and arrives at his stores by eight am, he gets a couple of hours to himself before the stores open at ten am. He works from ten to closing which is 6pm, heads home to get ready to walk two miles with his wife and then works somewhere until ten pm and afterwards calls it a night. I was interviewed on The Spreaker Live Show by Rob Greenlee. Rob interview me back in 2015 at New Media Expo. Back in 2010 I was on Fox News about Fastpitch TV. It was a pretty interesting experience. They sent a driver to pick me up and take me to Dallas. Once I arrived in Dallas I went up to the 10th floor. It may of been the 11th floor, I can really remember. Then I went into an office/studio and there was just one guy there. I thought it was so funny because I really expected it to be this busy TV Studio. I thought there would be all kinds of people buzzing around doing TV Stuff. Instead it was basically one guy with a camera, and the camera was pointing at a chair. I was told to sit ion that chair and wait. After waiting a few moments the interview started, but it was so weird because I was talking but could not see the people I was talking to. It was just me, and the guy that worked at that location. It really changed my concept of what a TV Studio was. My studio in my home may of actually been a better studio than the one I went to for the interview. I was interviewed on The Podcast Help Desk by Mike Dell. Mike and I talked about the early days of podcasting, and using podcasts to grow your business. We had a blast talking about entrepreneurship, and how to use podcasting in your entrepreneur efforts. I was interviewed on Stop Riding The Pine. Jaime and I talked about how I use podcasting as my marketing arm for my websites for quite a while. This was a fun interview, and Jaime is a great guy to chat with. I was interviewed on Reinvention Radio. I chat with Steve and Mary about multicasting and how to maximize your podcast content for a much larger reach. Great production on this podcast. I was interviewed on the Podcast Legends by Todd Cochrane. We talked about my experiences back in the early days of podcasting. Starting with my first podcast in December of 2004 up to Podcast Movement in 2016. It was a great walk back in history , and I really had a great time talking about podcast history. Interviewed On The Mindfulness Mode Podcast. I was interviewed on The Mindfulness Mode Podcast by Bruce Langford. In this interview I talked about my mindfulness. When I started the interview I was not really familiar with the term mindfullness. Now I know all about it. I really enjoyed this interview, and was excited to learn about mindfullness. 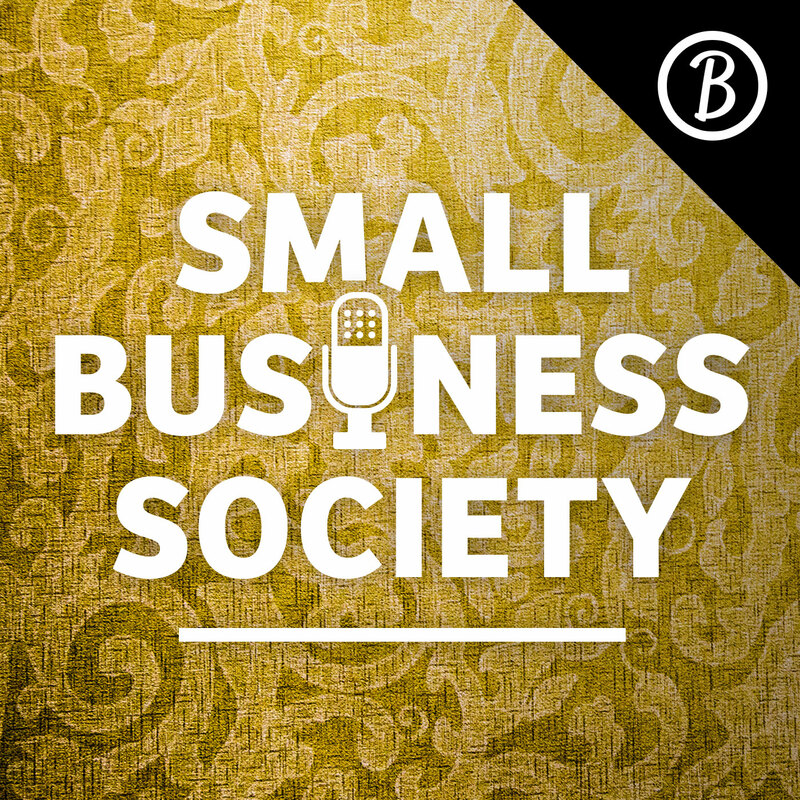 I was interviewed on the Small Business Society Podcast by Bidsy. In this interview I talk about my entrepreneurial journey throughout the years in business. I started in 1979 with my first retail store and, about 20 years later, I started by own e-commerce site Leland's Wallpaper still running today! I produced my first podcast in 2004 and am known to many as a podcast pioneer. I've currently launched a full service podcast creating and improvement company online at PodcastRepairman.com. I was Interviewed by Fred Castaneda on Skills In Screencasts And Podcasts. I talk about my multiple businesses that I created as well as podcasts. I've been making my podcasts for over 10 years and enjoy it very much. I love it so much that I have now created a service to help you develop your podcasts as well and maintain them called PodcastRepairman.com.